“Four Alternatives” list: four high-protein, non-soy, vegetarian foods. A lot of people seem to think soy is the only decent source of protein out there for vegetarians. For a long time, I thought seitan was another soy product. Turns out, it’s made mostly from wheat. And it has a texture very similar to meat, earning it the nickname “wheat-meat.” A four-ounce portion of seitan has between 20 and 30 grams of protein, making it the most densely-packed vegetarian protein source I know of. That it could pass for meat in a vegetarian dish is pure bonus, even if it’s not quite a whole food. You can find seitan at most health food stores, but if you are feeling adventurous, you can make it at home. Nothing new here; beans are a staple of almost every vegetarian athlete’s diet. My favorites are lentils, chickpeas and black beans, but almost every starchy bean contains 12 to 15 grams of protein per cooked cup. Soybeans, interestingly, contain the most of all (29 g per cup); perhaps that’s why soy plays such a big role in many vegetarian diets. Lentils, at 18 grams per cup, come in a distant second. Some call it a super-grain; technically it’s a pseudo-grain. Quinoa is actually a seed, and it comes in at 11 grams of protein per cooked cup. It has the benefit of being gluten-free, too. Quinoa contains a bitter coating that helps it to avoid being eaten by birds, so rinse your quinoa well before you cook it. (Cooking only takes 12-15 minutes in hot water.) 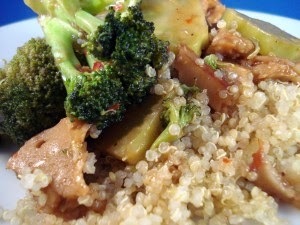 Quinoa makes a good substitute for rice as part of a high-protein vegetarian meal. Chances are, you’ve never thought of broccoli (or any green vegetable) as a high-protein food. But per calorie, vegetables like broccoli and spinach are very high in protein. The “problem” is that they take up a lot of room in your stomach, so it’s hard to eat enough of them to make them a significant source of protein. Still, at 5 grams of protein per cup, broccoli deserves a place on list, if only because it’s interesting.